Mayor of Merton, Councillor David Chung, attended Merton’s Environmental Sub Group at the civic centre in Morden yesterday. 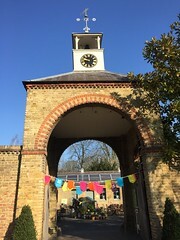 At the meeting, which was co-ordinated by Sustainable Merton and entitled How should organisations in Merton be planning for a low carbon future?, Councillor Chung supported Sustainable Merton’s call for community organisations, individuals and businesses to take responsibility for the planet’s future. They highlighted the importance of grass roots action to effectively create a low carbon future for all. Following the Paris UN climate change conference earlier this winter, Sustainable Merton invited CEO of Repowering London, Agamemnon Otero MBE, to speak about his experience of those talks and the potential of community-driven energy projects. Merton Council is the home of the Merton Rule, which, in the early noughties, was groundbreaking planning policy adopted by national government to ensure at least 10% of a building’s energy was generated from renewable energy. Today the council’s climate change projects officer Jon Buick spoke about the next steps in creating local energy opportunities. He focused on the potential of localised and decentralised energy systems to help meet Merton’s future energy needs and cut carbon emissions. Mayor of Merton Councillor David Chung said: “I was very inspired by the speakers today. Each and every one of us has a duty to look after our precious environment. The council is continuing to take steps to reduce its carbon footprint, using renewable energy where possible and installing energy saving devices in its buildings and street lighting. I am proud of Merton’s track record with developing innovative policy on climate change. But none of us can stand still and we need to be continually thinking of how we meet an increasing demand for energy, while minimising the impact this demand has on the environment. Decentralised energy systems, including local heat networks are localised energy centres that generate and distribute heat and power via interconnected pipe networks. The Mayor of London set out his expectation in the London Plan for 25% of London’s heat and power to be generated through the use of local decentralised energy systems by 2025. Shifting 25% of London’s energy demand to be supplied by decentralised energy could save up to 2.5 million tonnes of CO2in London per year. London Plan (2015).